Last Monday (March 25), WWE built for their WrestleMania 35 main event with a Beat The Clock Challenge pitted Raw Raws champion Ronda Rousey, Becky Lynch and Charlotte Flair against members of The Riott Squad . Lynch won, Ronda got angry … but there was nothing attached to the exercise, no effort for their showdown next Sunday in New Jersey. It set the predictable roof match where the main events (now with Charlotte as SmackDown Women 's champ) will have to face Ruby Riott, Liv Morgan & Sarah Logan on "Go Home" episode of the red show this coming Monday. And Raw Creative fixes their mistakes last week and makes a pretty serious provision about the old "CAN YOU GO ALONG!?!?" Booking staple … if they can't, someone could be started from the & # 39; Mania match. "If Rousey, Lynch or Flair betray any of their teammates, they will be removed from Raw Women's Title The Main Event of this Year's Show of Shows. " 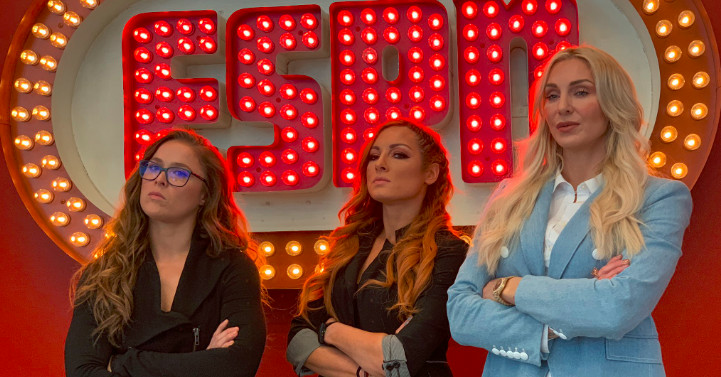 Odds are after WWE's great announcement of their historic battle and a press tour that included sending all three to ESPN – we're not getting a change. But I appreciate the effort to get the time I give them on Monday women, at least feel that it matters. And who knows? "Betray" is pretty vague, and it seems that actions that are not physically attacked can trigger removal to the 7th April match. Refusing to enter the game is likely to count. What if someone is physically unable to receive a mark? Could it give Mr McMahon an excuse to take The Man out of the fight again and cement her as the unwanted outsider to fight back in? As hard as it is to believe that WWE would change their main event at this late date, it is almost as hard to believe that they could resist throwing another twist into this already torn tale.